Spring has sprung here in the UK, well for the North West anyway, and I for one have been in the mood for a spring clean! Spring clean, done, and I'm now focusing my attention on my less than bland office. You see when I moved house at the end of 2014 I dumped any office related things into my spare room and since then have kind of avoid it. But the wind had changed for me and I'm totally in the mood for injecting a bit of life into my work area and hopefully using it! So in the past week I've taken to various blogs and of course Pinterest for inspiration and picked four of my favourites to share with you. 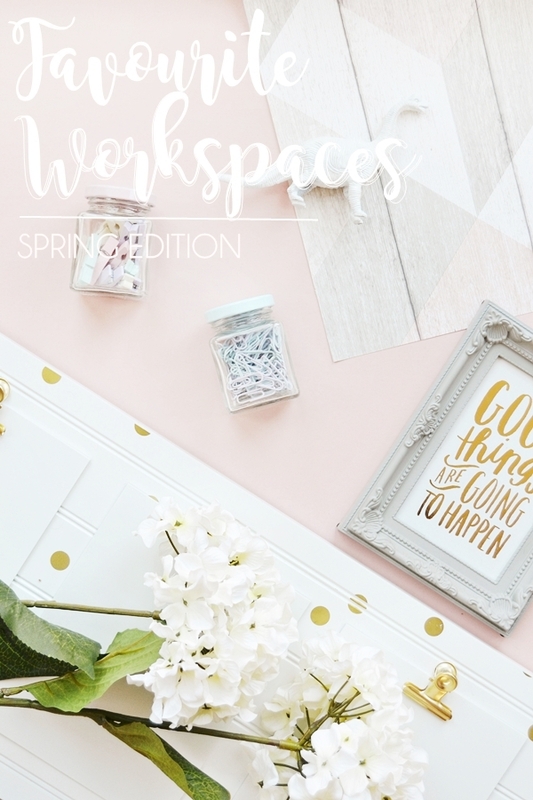 I've also realised that I've somehow become a pastel person and know that will be the spring theme of my new workspace! When it comes to interiors Kate knows how to get it just right - always effortless, fun and creative. What I love most about her workspace is that it's fairly clutter-free yet interesting, just enough to get you inspired, you know? The white wire memo board is a perfect touch with her simplistic colour scheme as any other colour of metal would have been too dominating, but the white let the clipped prints and lamp become the focus. This is a desk I'm just so inspired by as it's perfect for the brighter coming months. Desks with personality always grab my attention and whilst endlessly browsing Pinterest this without a doubt stood out to me. 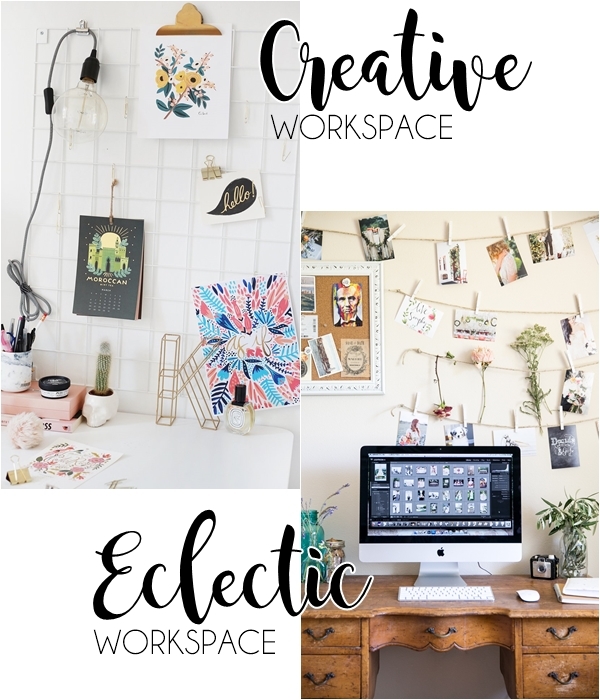 I decided to sum up this workspace as 'eclectic' as it's a mish-mash of styles, yet it's somehow remains feminine and intricate. What I most like about this space other than the antique desk that works so well, are the pegged photos and flowers that are clearly mementos of happy days which is a lovely touch. I don't feel I've established my own style enough to have a workspace like this just yet, but in the future a comfortable, inspiring work area like this would be a dream. My past desks have always been feminine yet simple which is most likely why I was drawn to this lovely desk. I love the interesting little trinkets, gold touches and of course the posy of flowers (for me a desk isn't complete without a bunch of flower, faux mind). But what I love most of all is the position of the desk, against the window. Not only does this mean you're facing the light rather than a wall but it means no glare against your screen - genius! This may or may not work with the desk I have (it's actually the same desk as the last image but with different trestles) but I will be moving it to see how it looks this week. My ideal workspace! Last but not least the desk that says GIRL BOSS. Well girl boss with a feminine edge! I was instantly draw to this office for the layout again, I sadly don't have enough space for this but I love how the desk dominates the room and it's so important it deserves a rug! I also like how the gold screen also adds interest to the decor, a good idea for renters or someone that likes to change things up frequently. 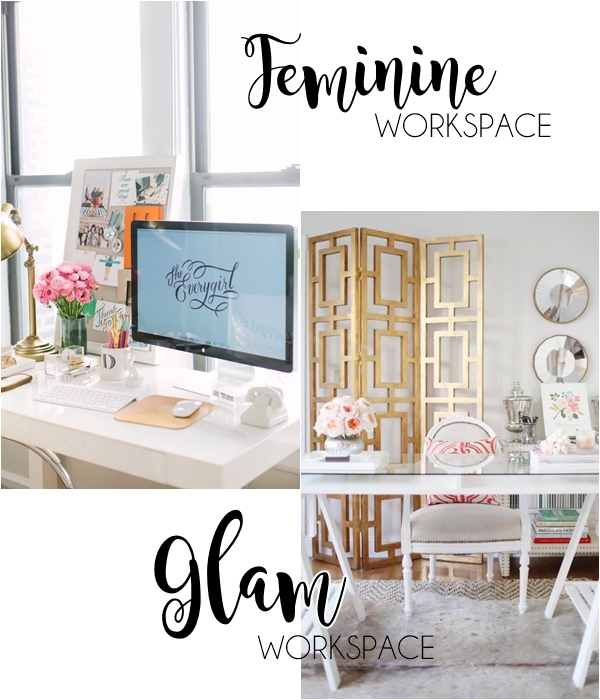 I don't think I'll ever have a glam workspace like this as it's not very 'me' but I still love it! I will 100% give you an update on my own office/work space with pics when I've completed my re-vamp!